I divided this gallery into sub-galleries for better organization. Having wi-fi access means that I was able to post daily. Click on a gallery to see the photos it contains. Also check out a few short videos I took using my Canon SD800 camera. These can be played using QuickTime. These also have audio so you can get a sense of the sounds there. If you're going to watch these more than once, do me a favor and download them onto your computer so my bandwith doesn't get eaten up! See the photo book I put together from this trip! If you leave me a message or comment, I'll do my best to return the favor! As always, I'm happy to answer any questions. Thanks for visiting. 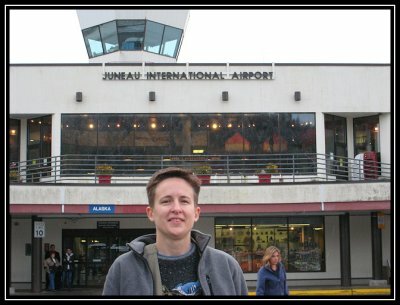 I arrived in Juneau in the morning and met up with a couple of other workshop participants. 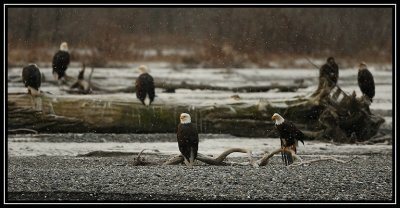 First visit to the Chilkat River Bald Eagle Preserve. We had a great day of shooting in spite of the relatively low light. Fortunately it didn't rain and there was hardly any wind, in spite of the forecast. These eagles are very different from the midwest eagles I usually shoot. 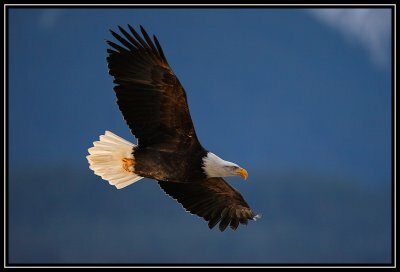 I never saw a single eagle catch a fish in the water. Instead they seem to wait for the almost dead salmon to come their way, then they waddle over and grab it. Several eagles will spend quite a bit of time fighting over a fish. Compared to midwest eagles, these guys have it easy! In these photos, I'm attempting to incorporate some things we've learned in lectures, particularly with regard to composition. Obviously the technical aspects of the photo need to be there, and I'm trying to avoid simple perching shots and make the photos a little more interesting. Also I need to practice my flight shots. Some of the things mentioned so far involve placing the subject in its environment, and use of lines. Hopefully that will be evident in the photos. Again at the Bald Eagle Preserve. I didn't get as many photos today, but I did get some decent ones. The weather wasn't bad, it was a little colder and we had a bit of sun in the morning. Our third day shooting at the preserve. There were a few inches of snow on the ground which was really great. 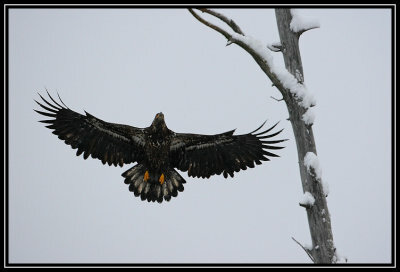 The views were spectacular and we were able to get quite close to the eagles. We spent the day photographing mammals at the Kroschel Wildlife Sanctuary. 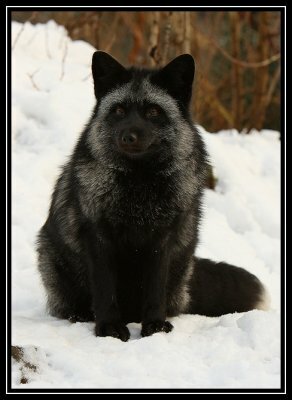 It was interesting, and more difficult than you'd think to photo captive animals. Not quite as exciting as eagles, for me at least! Today I worked on getting some flight and action shots. 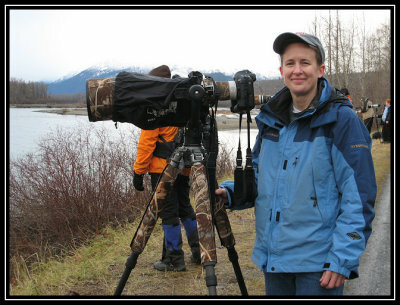 I found a great spot lower on the bank right across where there was a lot of salmon and the eagles were all around me. On my side of the river they were taking off and landing right above my head. 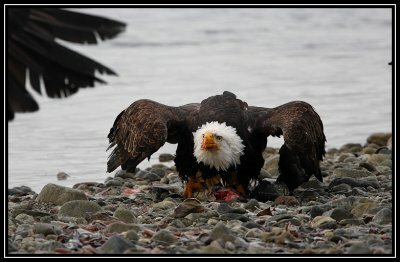 One eagle was perched on a tree in front of me and another came over and body slammed it right there! Another swooped just a few feet from my head - enough for me to duck down. At one point I heard someone behind me and it turned out to be an eagle walking through the woods on the ground. There was a piece of salmon about 10 feet behind me (someone must have dropped it there) and it just walked right over. Right across the river was plenty of action and opportunities for flight shots, plus we had some decent light, so I was very happy with the results. It was fun watching the eagles and also getting some good photos. Today was our last day. We checked out of the hotel, ate a late breakfast, and headed out to the preserve for a few hours of shooting. It was cloudy and dreary, so the light wasn't good. I worked on getting some non-flight action shots, and also got a few closeups. The preserve was pretty quiet as most of the other photographer groups were gone. I also finally got a chance to do a little bit of souvenir shopping in Haines. We caught the ferry back to Juneau at 7:00pm. I really enjoyed you daily reports especially the action shots from day 6. Well done! Liz, Day 6 is your best yet -- although I still love the monochromatic snow scenes of Day 4. The close-up, action shots are wonderful! Those you posted as Day 4 and Day 6 are awesome! Actually breathtaking. Thanks for sharing, Liz! Thanks for sharing your images. My husband and I enjoyed lookingat them. Awesome certainly fits as a comment!